To celebrate the 158th anniversary of the publication of Origin of species on 24 November, the full transcripts and footnotes of over 500 letters from and to Charles Darwin in 1873 are now available online. We have also added a page debunking some common myths and misconceptions about Darwin's life and work, where you can find out that Darwin did not introduce the term 'survival of the fittest' and he was not a stuffy father or an atheist. In 1873, Darwin continued work on insectivorous plants, concentrating on 'the most wonderful plant in the world', Drosera (the sundew), and its digestive processes. His exhaustive experiments were documented in Insectivorous plants, published in 1875. Investigating the sundew's sensitivity, Darwin found that the glandular hairs on the leaves responded to slight pressure and minute quantities of fluid. Material dropped in the centre caused the outermost tentacles to bend inward, so that the plant closed like a fist. Darwin was fascinated by this transmission of 'motor impulse', which seemed analogous to muscular contraction in animals. 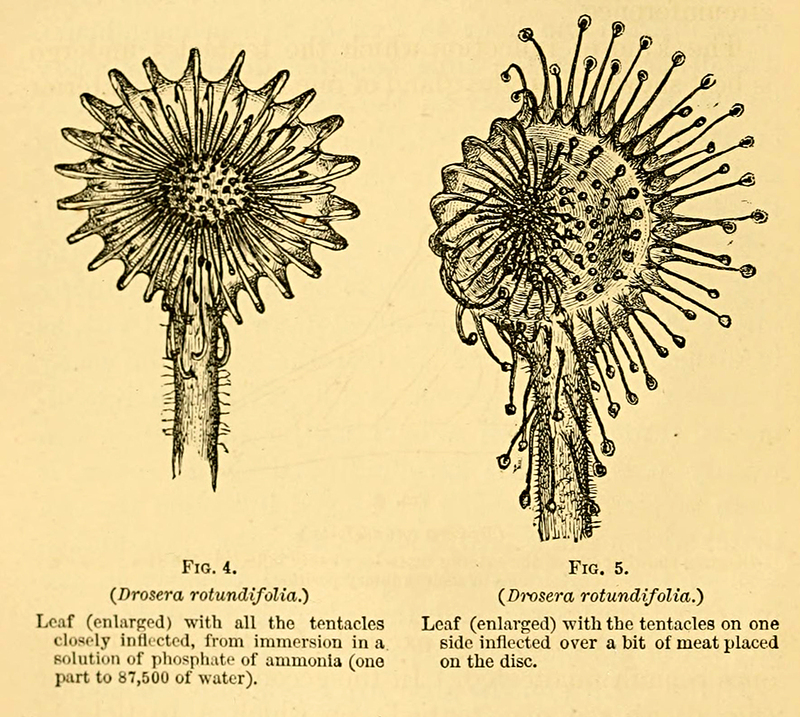 As well as working on insectivorous plants, Darwin was preparing to publish two more books in the near future, Cross and self fertilisation (1876), and Forms of flowers (1877). When he jokingly mentioned his need for staff, his son Francis proposed that he give up his medical career and become Darwin's secretary. This was a useful move for Francis, who collaborated with his father in his botanical work, and later became university lecturer and then reader in botany at Cambridge University. Darwin wrote this to Thomas Henry Huxley, in the hope that he would accept a gift from his friends of £2100. Huxley was overworked and in poor health, and in financial trouble because of a law suit. Darwin, though not in the best of health himself, organised the subscription and with some trepidation informed Huxley of his friends' actions. Fortunately, Huxley was delighted and accepted, and was able to take a long holiday in Europe. Darwin was invited to reflect on his own character when his cousin Francis Galton, who was interested in the inheritance of mental traits, sent him a questionnaire. As well as mentioning the traits listed above, Darwin revealingly declared, 'Special talents, none, except for business, as evinced by keeping accounts, being regular in correspondence, and investing money very well; very methodical in my habits.' Francis added to his father's virtues: 'sober, honest & industrious'. Had thrown Geographical Society’sProceedingsin waste-basket, but as Strachey shows such admirable powers of discrimination he will fish it out and read the whole article. Comments on 3d ed. of Sachs’s work [Lehrbuch der Botanik(1873)]. Wishes he were more controversial. Has become wonderfully interested inDroseraandDionaea. 9000 copies ofExpressionhave been printed and most are sold. Informs THH that 18 friends have given him a fund of £2100 to enable him to take a holiday. Asks whether GC knows who gave CD a scolding in lastEdinburgh Review[Apr 1873]. Comments about questionnaire CD completed for FG [for Galton’sEnglish men of science(1874)]. Describes his early interest in collecting and his education. Asks about determining the mean heights of two groups of men. Neptuniais evidently a hopeless case. Good news that fluid ofNepenthesis acid. No discovery ever gave him more pleasure than proving a true act of digestion inDrosera. Has become profoundly interested inDesmodium. Asks whether Frank [Darwin] can look over the whole dried collection of the genus. Has JDH any seed ofLathyrus nissolia?